Last week was a marvellous one! Many have joyfully celebrated the fifth anniversary of the election of Pope Francis, which he started by saluting the crowd by the simple expression “Fratelli e sorelle, buona sera”! In these five years we have witnessed a first non-European reviving the spirit of St Pope John XXIII and Vatican II. The cherry on the cake was a letter by Emeritus Pope Benedict XVI published on the eve of Francis’ anniversary, in which he publicly dismissed “the foolish prejudice of those who see Pope Francis as someone who lacks a particular theological and philosophical formation, while I would have been solely a theorist of theology with little understanding of the concrete lives of today’s Christian”. To the dismay of many, Pope Benedict XV insisted that there is continuity with Pope Francis’ pontificate. Moreover, in a symbolic gesture, during the same week, Pope Francis announced the canonisation of two other pillars of the letter and spirit of Vatican II: Pope Paul VI and Archbishop Óscar Romero. Although Vatican II was convened by St John XXIII – il Papa Buono – he died after the first session. Thus it was Pope Paul VI who guided the Church through a period of internal change, social and political upheaval. Paul VI worked hard to keep progressive and conservative elements together in the Church. In common with Romero, Paul VI was the Pope of the poor. It was he who presided over the 1968 assembly of Latin American bishops where the Latin American Church undertook its “preferential option for the poor” – another tenet of Francis’ pontificate. Paul VI will also remembered as the first pope who dismissed the papal tiara, an emblem of intertwined temporal and spiritual power, abolished the Pontifical Court and tried to simplify the Vatican administration. While Paul VI was the promoter of the development of peoples (Populorum Progressio), Romero championed Paul VI’s teaching by his blood. Romero’s willingness to speak truth to power quickly made him an icon of the Church of the oppressed. 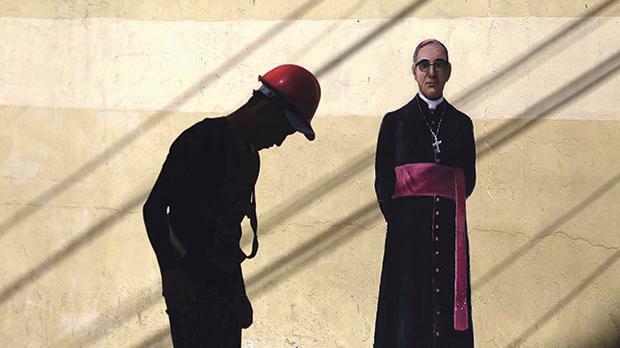 While the Church’s practice is that a martyr who dies out of ‘hatred for the faith’ needs no miracle to be declared a saint, some in Rome argued that Romero was killed for political reasons and stalled the process; some churchmen also frowned on what they considered to be his leftist political views, especially liberation theology. In Romero’s case his miraculous intercession is believed to have saved a pregnant woman, Cecilia Maribel Flores, who was at risk of dying in childbirth. Romero was chosen to become Archbishop of San Salvador because of his conservative bent. However, when he saw poverty at close quarters, Romero became a champion of the oppressed and vocal critic of his country’s authoritarian right-wing government. In his homilies and radio broadcasts he denounced the structures of sin. Romero angered the country’s military dictatorship by writing to US President Jimmy Carter requesting him to the halt military aid to El Salvador. He repeatedly called for an end to the brutal killings of political opponents. Because of this, on March 24, 1980, he was shot dead by a State-backed death squad while he was celebrating Mass in a hospital chapel in El Salvador. No one has ever been shot for building a hospital. Many, however, are murdered – sometimes physically and more often morally – because they consistently fight against the structures of sin, among which one should include unbridled capitalism and brutalities of every political hue. However, many use double standards: for these it is fine to condemn and fight against the cruelty of communist regimes, but one has to be extremely cautious where right-wing brutalities are concerned.